How much talent are we wasting? 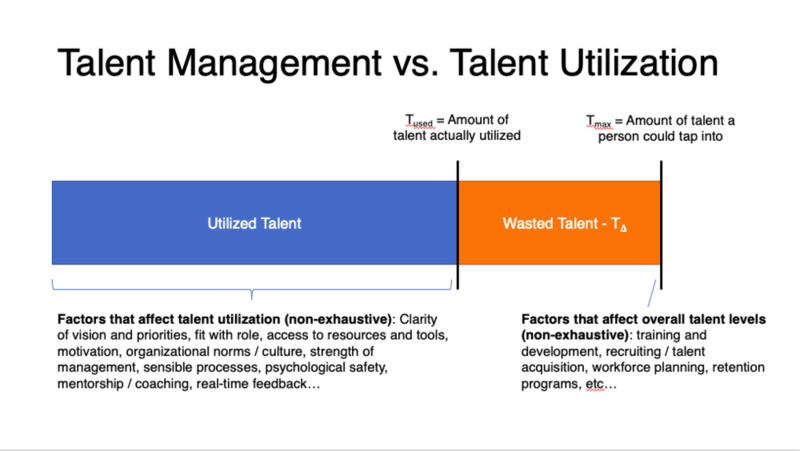 Something I think about often is the difference between how much talent individuals in a company (or myself, personally) have, versus how much of that talent is actually utilized. Even if for any individual person that delta is modest (it’s not, but let’s pretend) that’s still a big waste across an entire enterprise. By waste I mean, a person not being able to fully use his / her skills and capabilities, either because they don’t have an opportunity to or because something about the organization gets in the way. The challenge is, how do you (as individual or as a CHRO / CPO of an enterprise) increase talent utilization? How does one create an organization that doesn’t waste its talent? And it’s not just a matter of leaving money on the table. It’s horribly dissatisfying to feel like your talent (and time) is wasted. Some might even consider it to be immoral (I do).